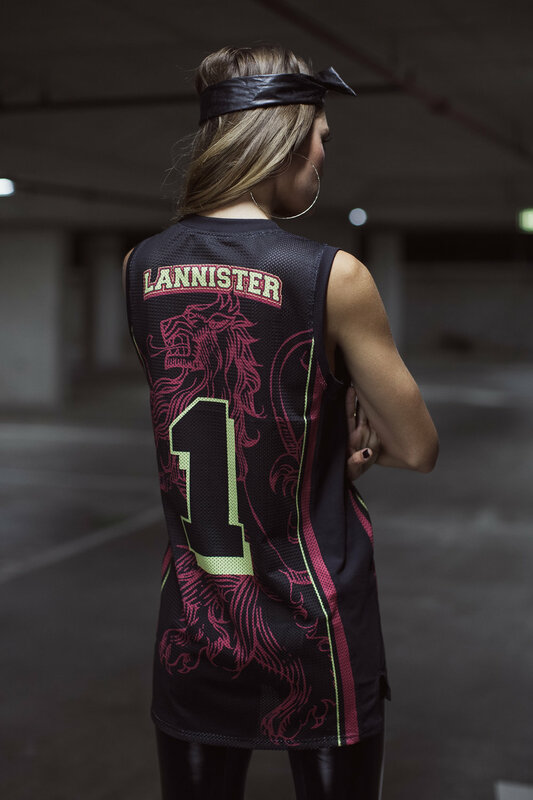 Black Milk Clothing's Game of Thrones (GoT) collection was released between the airing of the seasons three and four. By that time I was already a major fan of the show and board game, so upon learning that I would get the chance to work on a GoT collection I was very excited. I would go on to design almost 75% of the printed garments in the range. Ultimately, the collection was a great success and broke Black Milk's previous sales record. Below is a small selection of the pieces I designed for this collection. Daenerys' dragon eggs had been a prominent prop and were well known by fans. They were associated with a powerful woman and had strong texture and colour themes. I saw a great opportunity to create a set of licensed products that evoked the show but appealed to everyone, fan or not. Interestingly the product development team, which created the garment patterns, had just made a new swimsuit and the prints looked killer on this new shape as well. One of Black Milk's only unisex garments the shooter was a common feature in any licensed collection. Sports themes were preferred and so I created shooter designs for each of the major houses, Stark, Lannister, Baratheon and Targaryen. Key to every game of thrones episode is the intro credit sequence which zooms around a map showing where upcoming scenes will take place. So iconic did this sequence become that it was adopted by The Simpsons, Major League Baseball and Sesame Street. Littlefinger is a popular character from the series almost entirely due to the doublespeak and subtle threats he wields each episode. Given his quotes are some of the best in the show they made a great option for a pruely typographic design.